Watford FC fans made an enormous LGBT+ Pride flag in the stands during their club’s Premier League match against Manchester City on Tuesday night (December 4). Watford FC’s Pride-themed gesture was inspired by Stonewall’s Rainbow Laces campaign, which has been marked by the majority of clubs in the Premier League in recent weeks. The club’s LGBT+ fan group Proud Hornets posted about the human-Pride flag on Twitter, including a video of the moment at Watford FC’s Vicarage Road stadium. “Wow, just wow! Thank you to the whole #watfordfc family you have done us proud!,” wrote Proud Hornets on Tuesday (December 4). Watford FC lost 1-2 against Manchester City in the Premier League match. Proud Hornets’ post has been liked by more than 1,500 people. 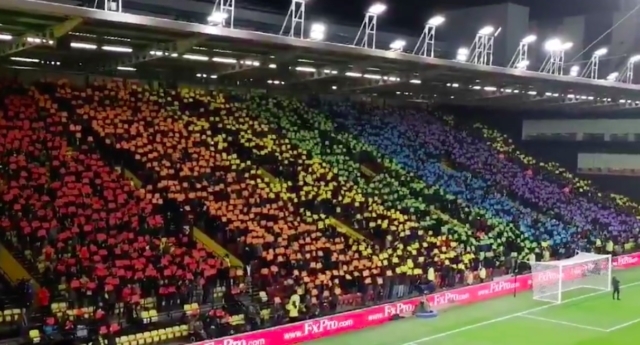 Football fans have praised Watford FC’s show of support for the LGBT+ community. “Might get some stick for this, but rivalries aside, that looks great,” wrote the football fan club for Football League One side Luton Town. The majority of football clubs in the Premier League gave their social media profiles a Pride-inspired update to mark Stonewall’s LGBT+ laces campaign. However, the teams—including Manchester City, Chelsea, and Arsenal—received homophobic abuse for their pro-LGBT+ support. The anti-gay messaged has been liked by more than 4,000 people.